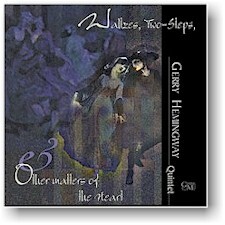 The beauty of waltz forms and European folk traditions, combined with the excitement of great improvision, marks this recording as the culmination of twelve years of Gerry Hemingway performing with his Quintet. Hemingway was a member of the pathbreaking Anthony Braxton Quartet from 1983-95. He work also includes recordings/performances with Fred Hersch, Kenny Wheeler, John Cale, Ray Anderson, Reggie Workman, and Don Byron. All compositions by Gerry Hemingway. Recorded on (1,2,5,7) Nov. 2, 1996 at the Berlin Jazz Festival, Berlin, Germany, and (3,4,6) Nov. 4, 1996 at the Fasching in Stockholm, Sweden.